From Syria to Yemen, from South Sudan to Venezuela, war and political crisis are causing human anguish on a scale unseen in a generation. That conflict and crisis take a high human toll is hardly new, of course. Yet the scope of suffering today is striking. 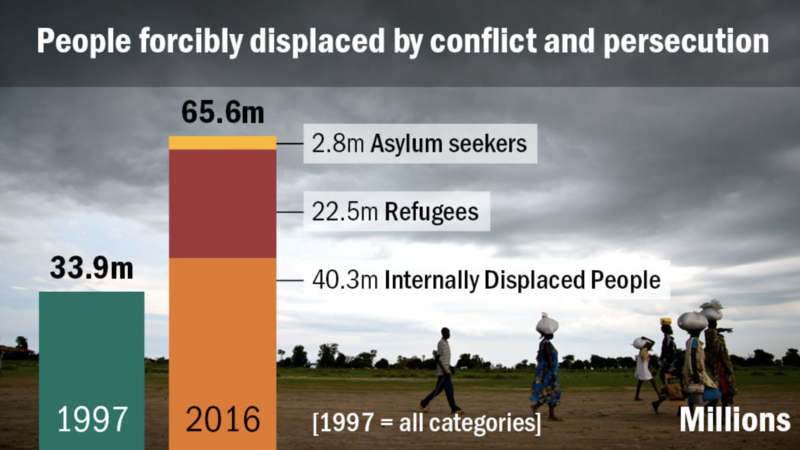 The number of people displaced globally by conflict and persecution stood at 65.6 million at the end of 2016, the greatest number since World War II. 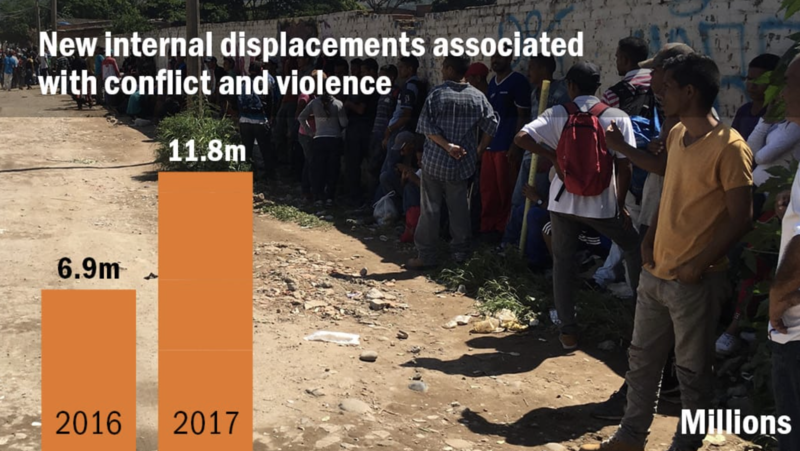 Figures released earlier this month show that there were 11.8 million new internal displacements in 2017, nearly double the 6.9 million in 2016. 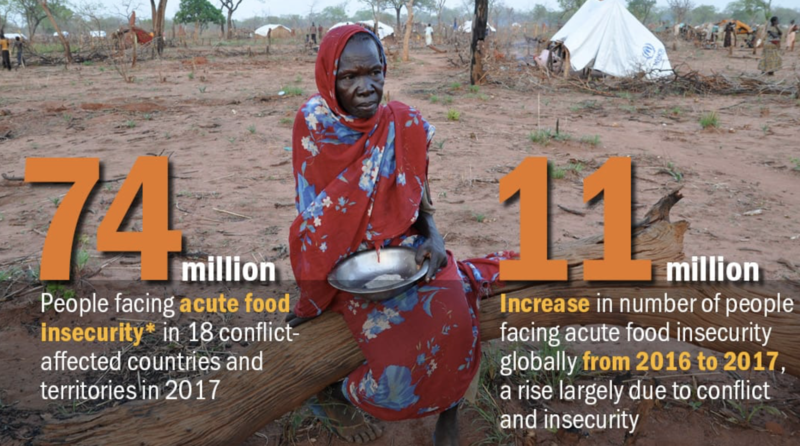 The number of people facing acute hunger globally due largely to conflict and instability reached almost 74 million across eighteen countries in 2017. The trend is clear: war and crisis are destroying more lives and livelihoods, pushing more people toward starvation and driving more people from their homes. First is simply that the last decade has seen an increase in conflict and political violence. But deepening human misery comes not only from more war and violence. It also comes from the manner in which many actors – whether leaders, governments or non-state armed groups – are pursuing military and political objectives. Too often these actors gain from human deprivation. Sometimes they deliberately inflict pain on civilians, attacking, forcibly displacing or otherwise controlling populations, including by determining whether, where and how they get access to aid. At other times, they use heavy-handed military or political tactics without attention to the enormous suffering they are causing. This instrumentalisation or disregard of civilian harm is clearly in evidence in some of today’s worst conflicts, from Yemen to Syria to South Sudan. Such disregard is also a worrying feature of many political and socio-economic crises that fall short of armed conflict yet still produce large-scale humanitarian crises, like that of Venezuela. Yemen is in the throes of regionalised civil war. The main protagonists all have used tactics that exact a terrible human cost. All sides have exacerbated a humanitarian crisis on an astounding scale: over 22 million Yemenis, 75% of the population, need humanitarian assistance; some 8.4 million are on the brink of famine. After completely closing Hodeida port in response to a Huthi missile fired at Riyadh in November 2017, the coalition partially lifted the blockade the following month. That move has alleviated Yemen’s plight to some extent. Saudi Arabia and the United Arab Emirates also announced a $1.5 billion contribution to UN humanitarian efforts. Yet aid is a stopgap measure that cannot be a substitute for commercial imports. The war in Syria also has seen horrendous human suffering as a result of actions by all sides, none more consequential than thse of President Bashar al-Assad’s regime. The regime has repeatedly used tactics that deliberately harm civilians for political and military gain. 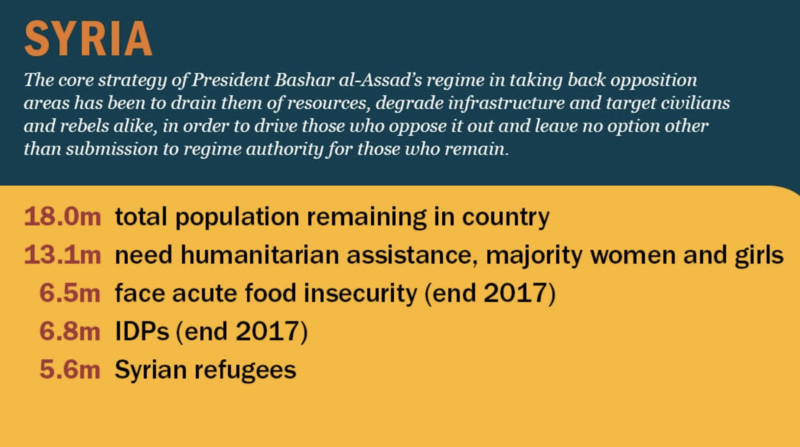 Its core strategy in taking back opposition areas has been to drain them of resources, degrade infrastructure and target civilians and rebels alike, in order to drive those who oppose it out and leave no option other than submission to regime authority for those who remain. The aim is also to send a clear message about the price of resistance. 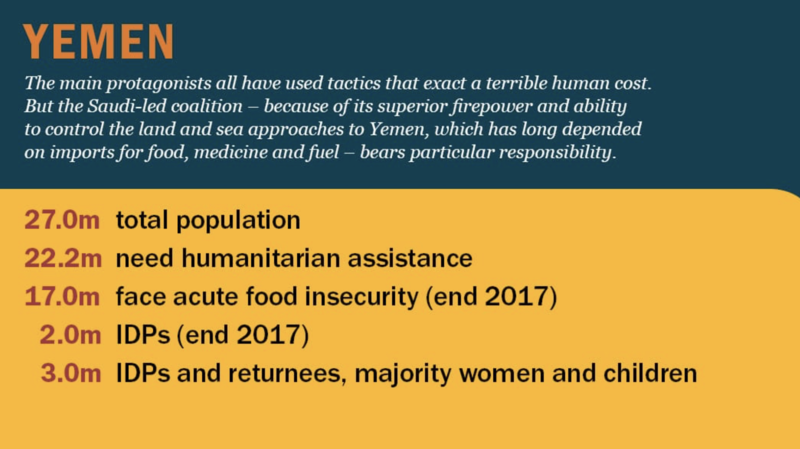 Tactics include controlling whether and how humanitarian aid reaches civilians in need, now numbering some 13.1 million overall – roughly two thirds of the population that remains in the country and a proportion equivalent to over 50% of the pre-war population. These numbers include over six million facing acute food insecurity and over two million in UN-declared besieged and hard-to-reach areas. Backed by Russian air power, government forces have bombed civilians and civilian infrastructure – including schools and hospitals – in rebel-held areas. They have also used chemical weapons against civilians. Rebel groups notably have carried out their own atrocities and sieges of civilian areas, if not on the same scale as the regime. Meanwhile, the Islamic State (ISIS) has used chemical weapons, albeit on a much smaller scale than the regime, and mass executions in areas under its control. 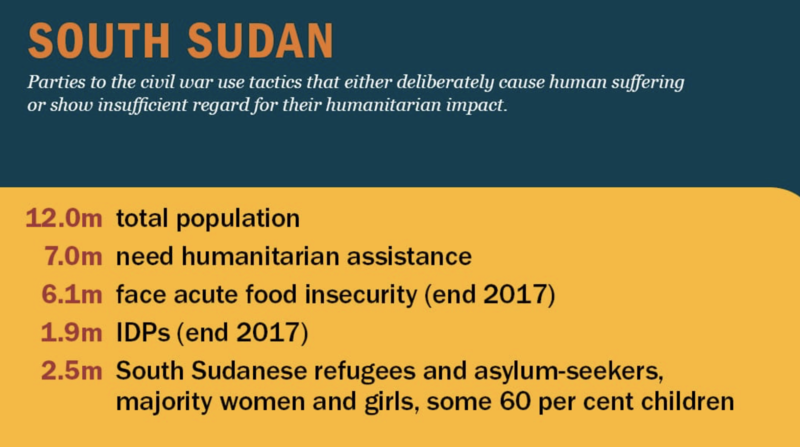 In South Sudan, too, parties to the civil war use tactics that either deliberately cause human suffering or show insufficient regard for their humanitarian impact. Government troops, rebel forces and armed groups of all stripes have repeatedly attacked civilians or, through raiding and pillaging, left them without the means of sustaining themselves. Armed groups often try to direct aid to populations they control, while seeking to withhold it as a way to punish or demand the loyalty of populations they perceive as supporting their enemies. The government itself has sought to deny aid to populations under rebel control as a means of pressuring them to accept peace on the government’s terms (though aid groups usually have been able to negotiate access eventually). Harassment of and attacks upon aid workers are common. Such incidents are aspects of a broader “scorched earth” approach to fighting that does not spare aid operations, medical facilities, religious institutions or schools. Fighters often double as bandits and, given the economic crisis, humanitarian aid is one of the few assets available to steal. Lawlessness, in the form of attacks on aid convoys and roadblocks set up to extort agencies, also contributes to the need for expensive airdrops of food – reducing the amount available for hungry civilians. 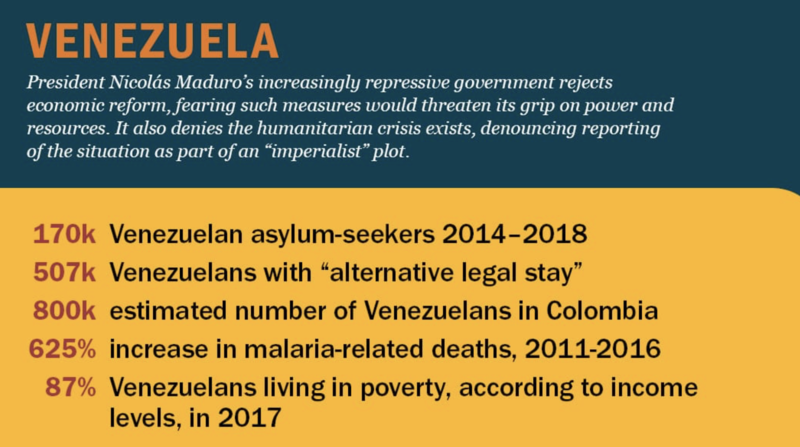 Venezuela’s humanitarian crisis stems not from war, but from political crisis and malfeasance, as illustrated in a recent Crisis Group report. With the economy in freefall, hundreds of thousands of Venezuelans are fleeing poverty, hunger and deadly disease epidemics. Yet President Nicolás Maduro’s increasingly repressive government rejects economic reform, fearing such measures would threaten its grip on power and resources. Current economic policies – including price and currency controls, state subsidy and rationing of food, and expropriation of commercial assets – directly benefit key constituencies in the regime, above all the military. Reversing those policies would threaten these interests. Venezuela’s neighbours are left to cope with the consequences. Colombia now hosts an estimated 800,000 Venezuelans, 450,000 of whom are believed to be staying in the country without residency papers. Many, especially those with limited funds, are concentrated in the border city of Cúcuta, compounding the poverty, urban sprawl and unemployment that already existed there. With Colombian armed groups competing for control of lucrative smuggling routes along the border, the spillover could endanger the country’s fragile peace process. As these cases illustrate, the deliberate harm of civilians or the use of tactics with scant regard for human suffering are all too common across today’s landscape of war and crisis. All the more disconcerting is that state parties and their allies almost certainly shoulder the lion’s share of blame. It is difficult to generalise about reasons for this trend – in other words, to identify the geopolitical currents that underpin the widespread use of tactics that target or otherwise harm civilians. The conflicts are diverse as are the states involved. Indeed, it is debatable whether parties are more likely to resort to the use of such tactics today or whether their use is simply more prevalent because conflict has increased. Greater visibility of such tactics, given expanded media coverage, may also contribute. But a handful of factors appear to have helped create an international environment permissive of such abuse. The first follows from the protracted nature of many conflicts. While today more wars tend to be intrastate, most involve outside powers and an array of non-state armed groups. It is hard to find a settlement that meets the interests of the warring parties – from the major or regional powers involved, to national actors, to local commanders that may have direct access to revenue streams and thus considerable autonomy. Violence often spreads across wide swathes of the country, leaving few areas unaffected and few safe havens for civilians. Warfare is increasingly urbanised, with non-state armed groups embedded in the general population, which also means fighting exacts a higher civilian cost. In wars characterised by mass atrocities from the beginning, the behaviour of belligerents rarely improves during the course of the conflict. In some cases, as wars drag on, growing hatred and resentment, the desire to avenge abuses and, in many instances, the wish to protect financial interests that instability sustains tend to increase incentives on all sides for more brutal forms of violence, or tactics that result in greater civilian harm. In wars characterised by mass atrocities from the beginning, the behaviour of belligerents rarely improves during the course of the conflict. Indeed, parties often point to excesses by their opponents to justify their own. Second, mounting geopolitical tension, including among major powers, is likely to have contributed. Major powers tend to pull their punches on abuses by allies, while reserving the harshest criticisms for their enemies. Last, it is difficult to escape the fact that a decade and a half of post-9/11 Western counter-terrorism operations have played some role, albeit difficult to define precisely. Fairly or not – and undoubtedly in the service of self-interest in many cases – leaders across the world have interpreted these operations, and the militarisation of what tends to be a political problem, as a signal that draconian tactics are more permissible against their own enemies. Whatever the precise causes, the pervasive use of tactics that cause such civilian suffering – whether deliberately or through calculated disregard – should be a cause for alarm. It is not just a moral concern. While such tactics might serve the immediate interests of some leaders, governments or militias, the massive humanitarian crises they provoke can themselves be sources of instability and recurrent conflict. At a minimum, they inject further uncertainty into wars and crises that are already difficult to resolve. Without redoubled efforts to forge political solutions, today’s overwhelming levels of displacement, the destruction of cities, homes and infrastructure, and the hunger, destitution and trauma, likely will only grow.